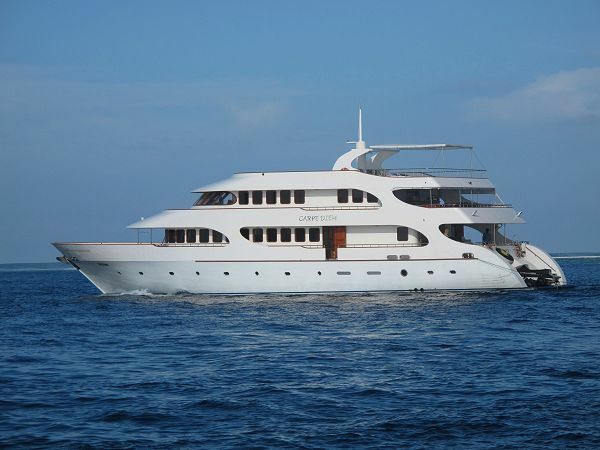 If you have ever visited the Maldives, you will have seen fleets of luxury liveaboards motoring around the atolls taking their guests to well-known dive sites to experience the underwater beauty that the Maldives is famous for. This September, one of those liveaboards, the MV Carpe Diem, housed a rather different clientele – the honeymooners and adventure divers were replaced with studious environmentalists embarking on a training course to learn the monitoring techniques necessary to collect reef health data – Reef Check. From five different countries, 10 participants, two of whom were Maldivian, came together to learn the Reef Check methodology on an annual research expedition organised by nonprofit conservation organisation Biosphere Expeditions. 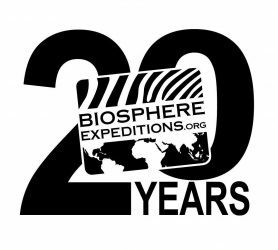 Biosphere Expeditions recognizes the importance of training local Maldivians, alongside citizen scientsts from around the world. Once the expedition is over, and most participants have returned to their temperate homes, the Maldivians have continued access to their reef and with their newly acquired knowledge, can support Biosphere Expeditions’ work with additional Reef Checks, amongst them the first such all-Maldivian survey in 2014. With a global El Niño event and documented sea surface temperatures rising, the team were on high alert for signs of coral bleaching. leaching occurs when corals are stressed resulting in expulsion of the symbiotic algae (zooxanthellae), which not only give them their colour, but provide them with food via photosynthesis. Without their zooxanthellae corals appear bright white or luminous yellow and it was this sign that the team was on the look-out for. Initial training dives around Baros Resort’s house reef revealed no such incidence, but Mariyam Shidha Afzal, this year’s expedition scientist and a previous Maldivian recipient of Biosphere Expeditions’ training programme said, “Bleaching can be quite localised, so we may find when we travel south that things are different.” Fortunately this was not the case and there was minimal bleaching at all survey sites. Storm damage, on the other hand, was quite severe, especially at Bathalaa Maaga and Holiday Thilla, and it was easy to see why, as throughout the expedition, monsoon storms battered the more exposed atolls, causing one of the surveys to be aborted. So, sadly all good things must come to an end. It has been an excellent expedition, with a hardworking, diligent, enthusiastic team. The fact that everyone passed their Reef Check tests first time was testament to the effort put into studies. And despite being a diverse group from many different countries, with an age difference of over 30 years, the team gelled really well and we all had a lot of fun together. Thanks also to Shidha, our scientist, who stepped in at the last minute and did a great job. I must mention the fantastic crew of the Carpe Diem who supported us both on board and under water – without them, some of our transects would not have been laid, due to the extreme weather and currents we encountered, so they really were integral to the success of the expedition and the collection of valuable data. Thank you! In addition to all our Reef Check data, (which will be published in the 2015 Maldives Report), we also collected ID shots of manta rays, which I will submit to Manta Matcher www.mantamatcher.org. This a conservation group that endeavours to learn more about the habits of Manta rays worldwide, with a view to their protection. Of course our whale shark encounters that were also mapped and logged will also be submitted to the Maldives Whale Shark Research Programme http://maldiveswhalesharkresearch.org. Using IS3, a programme initially designed by NASA to identify constellations, we were able to identify two of the sharks we saw by matching ID photographs of their markings to those already on the MWSRP’s database. Our sharks were called Adam and Kokko, two juvenile males taking refuge in the warm sheltered waters of Ari Atoll. So thank you all for your energy, your laughter, for joining me on the sun deck for yoga at dawn, for revising late into the night, for supporting and helping each other throughout the week – you really made a fantastic team, and I hope to meet you all on another expedition someday. 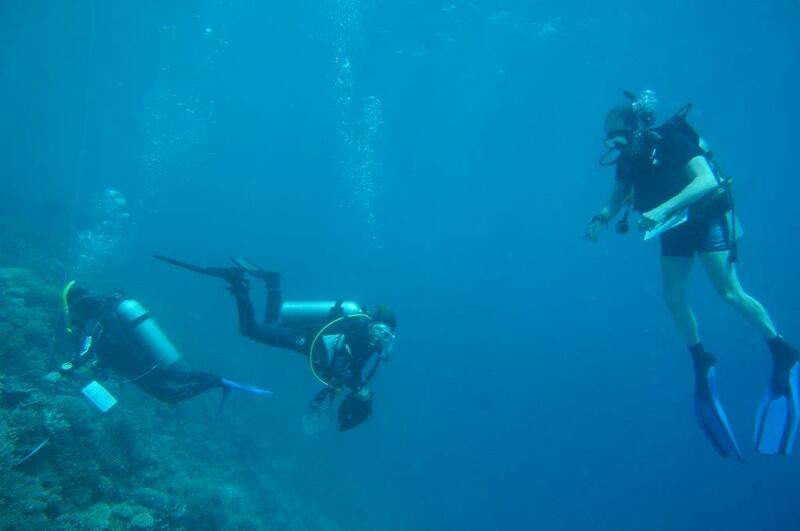 Our final Reef Check survey at Holiday Thilla went exceptionally smoothly. We recorded a lot of storm damage, but fortunately there was no actual storm during our data collection. Next on the agenda was our whale shark survey, but the whale sharks beat us to it, interrupting our data entry! We grabbed our masks and snorkels and hopped back onto the dhoni (our dive boat) and set off down the transect to catch up with the shark. All in all we had five encounters with three individuals, the last unfortunately disturbed by a dive boat and jumping divers who scared it away. Iru, our placement from the Maldives Whale Shark Research Programme (MWSRP), and the dive guides were outraged by the behaviour of the dive boat and rightly told them so! Encounter protocols are so rarely followed and although we were in an MPA (marine protected area), there is no enforcement and no limit on the amount of boats (and people) that can safely enter an area where a whale shark is present. It is very common for the sharks to bear scars as testament to this unregulated behaviour. After a couple of hours of surveying, we headed back to the Carpe Diem and listened to Iru’s excellent presentation about the whale shark and the work that the MWSRP are doing, and later visited their headquarters on Dighura atoll – it was great to see such inspiring work taking place. Our third Reef Check survey at Kudafalu went well and we arrived at Digga Thilla with high hopes and great expectations. Digga Thilla is a submerged pinnacle, rather than island and does not break the surface of the ocean. Its exposed position means that it is at the mercy of unpredictable wave action and current – and due to the recent storms we have been subjected to, Wednesday was one of those days! After fighting the current and surge for a while, we had to abort, leaving our survey unfinished. Well done though to Lori and Shidha for battling through and actually finishing their part of the transect! Saddened by the fact that we had failed in our data collection, we came up with the idea that perhaps in the coming months a team of Maldivian Reef Checkers (trained by Biosphere Expeditions in previous years), could return to Digga Thilla and survey the reef in our place! 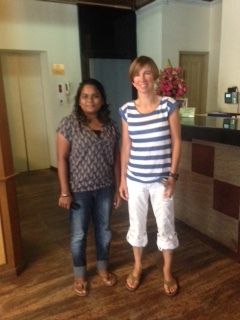 Iru and Ryan, our current Maldivian trainees thought that was a great idea – we look forward to hearing their results! Our first transit across open ocean from one atoll to another greeted us with storms – and these continued into the night. With the Carpe Diem rocking wildly in the wind and waves, it was quite a rough night’s sleep, for everyone except Yannick and Desiree who slept through the whole affair! It’s been an exciting couple of days for the Maldives team – we’ve dived with reef sharks, eagle rays and enormous humphead wrasse during a dawn dive before work, and snorkled with Manta rays after dinner! Everyone passed all their tests first time round so no re-tests were necessary. Congratulations to you all! This also meant that we could all focus our attention on the survey work. We’ve now completed two full Reef Check surveys in Rasdhoo Atoll and Bathalaa Maagaa, and so far the news is good – no significant bleaching. The stormy weather is still with us, but let’s hope it will be a calmer night tonight, with clear skies for tomorrow’s survey in Kudafalu. The team worked hard today, studying furiously both in and out of the water. Reef Check training means complete immersion in the marine environment, mentally and physically, absorbing new information about all aspects of the reef – the substrate, the fish and invertebrate life, as well as the impacts on the reef such as destructive fishing practices, coral bleaching and predation. This year is an El Nino year, with predicted rises in surface ocean temperature, and we have already seen small signs of coral bleaching here on the Baros house reef, but nothing to be alarmed about. As our expedition continues and we travel further south, we will no doubt glean more information about other effects here in the Maldives. As the day drew to a close, all the hard work paid off – with a glorious sunset as a backdrop, the entire team sat, and passed their fish test! Well done everyone! Only the substrate test and invertebrate tests to go tomorrow. With all team members present and correct, we made our way to the Carpe Diem, our magnificent research vessel. Ours is a busy schedule, so without further ado, briefings were given and the Reef Check programme initiated, whilst we cruised to our training site at Baros to complete our first dive. Baros, as with many islands in the Maldives, is a resort island and boasts well-kempt house reefs complete with megafauna. Though here, unlike many of the resorts, Reef Check training is offered to their guests. 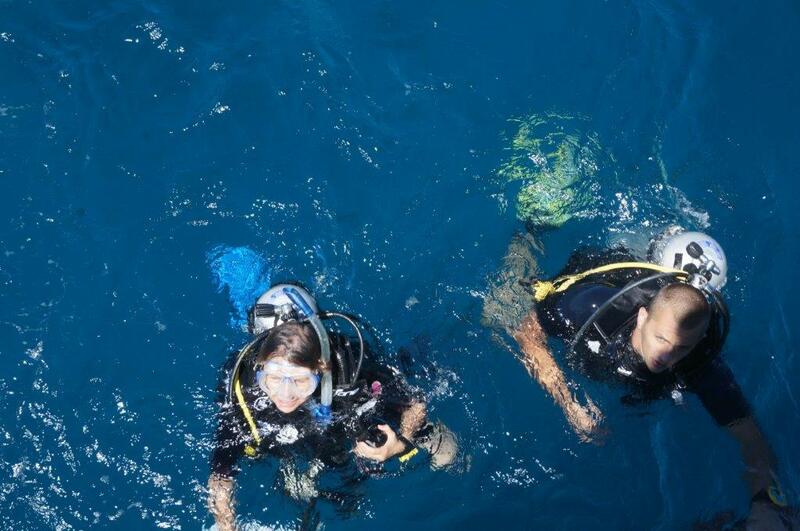 Ronny and Karin, the managers of the Baros Dive Centre, uphold the ethos of Reef Check and fully understand the benefits of long-term monitoring. Sadly, this is all-too uncommon around the Maldives, a country which depends on reefs for everything from its existence to substanance to tourist income. The team had a great first dive and for some, who hadn’t dived in a while, it was a chance to become reacquainted with the ocean – some even saw their first shark, a white tip that moved silently through the group and off into the blue. Tomorrow the pressure is on with training lectures and dives all day, and the first test tomorrow evening! Now though, it’s been a long day, so time for a good night’s rest. I’ve arrived in Male’ – descending through stacks of cumulonimbus to be greeted by spectacular sights of atolls framed by a turquoise sea. It’s hot and sunny – 30 degrees celsius in the shade, but the forecast shows a front on the way, so we may meet some cooling showers during the week. Shidha and I have met, shared our expectations for the expedition and discussed the week’s programme – she is familiar with the route we are taking and looking forward to training you, as am I.
I have a Maldivian phone number now – (+960) 768 3387, so if you need to contact me in an emergency this is the number to call. 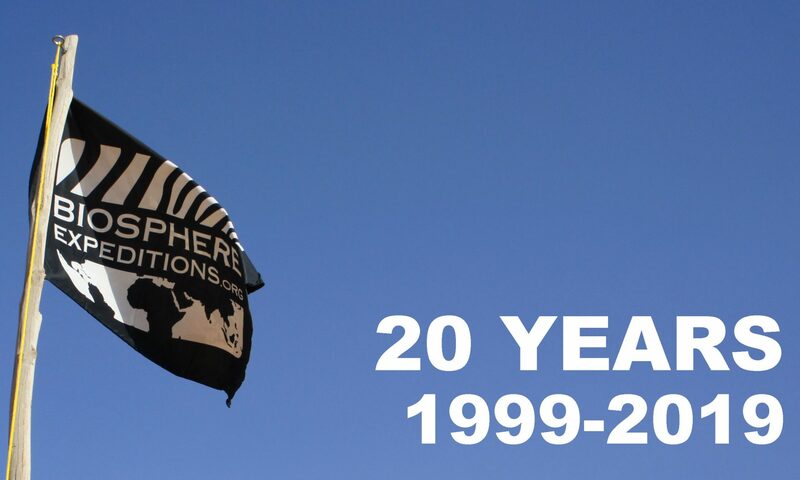 In 1998 there was a significant global El Niño event that virtually stopped water circulation in the Pacific and Indian Oceans, resulting in floods in west, north and south American arid regions, and drought in the Australian and New Guinea rainforests, eventually resulting in forest fires. It upset the Asian subcontinent monsoons and led to crop failures and food shortages in the tropical nations of the world. In the ocean, the ‘blocking’ of the equatorial oceanic gyre of currents led to significant warming of the shallow seas of the tropics, failure of the anchovy fishery of Peru, and the death of many coral reefs. The Maldives reefs suffered at least 90% coral mortality, because a lens of hot water, about 3-5 degrees (Celcius) above the usual maximum (that is 30-31 degrees Celsius) lay over the reefs of the country for four weeks. This stressed the corals and led to significant ‘bleaching’. Bleaching is a process where stress to the corals results in them expelling their colourful symbiotic algae (called zooxanthaellae), thus going pure white and exposing their calcium carbonate skeletons. It is often the initial cause of death to the corals as the symbiotic algae give up to 80% of the energy to the corals from the sugars they produce by photosynthesis. Corals can survive initial bleaching, but only if the hot water stays over the corals for a short period, or at a lower temperature. In these circumstances, corals can reabsorb zooxanthellae into their tissues from the water column. However, the 1998 Maldives bleaching event was so severe, that it killed most corals outright. The recovery of the reefs has been from juvenile corals settling on the dead coral reefs, and re-growing. 1. Monitoring the recovery of the 1998 bleaching event at reefs that were first surveyed before the event, in order to see the amount of live coral that now exists at shallow depths. 2. Re-surveying sites first visited by MCS in 2005, such that we have indications of reef health, fish populations, and any large megafauna such as whale shark, manta rays, turtles, large fish and reef sharks. We recorded a ‘new’ whaleshark in 2011. 3. Training, via Biosphere Expeditions’ placement programme http://www.biosphere-expeditions.org/placements, of local Maldivians from government and civil society to monitor their own reefs and providing training and funding, courtesy of LaMer and the Rufford Foundation, for exceptional individuals to become Reef Check trainers themselves. These individuals trained up three local Reef Check teams since 2014 and undertook the first ever all-Maldivian Reef Check survey in November last year. 4. We have published four technical reports on the condition of the reefs since 2011. This and last year are also El Niño years, where the east–west surface current movements of water across the planet’s equator is stalling and stopping. This results in the sun heating up surface waters in some locations, such that bleaching events have occurred. They have occurred in the tropical west pacific, Hawaii, French Polynesia, and to a lesser extent, the Maldives. Northerly Indian Ocean reefs (around the Arabian Gulf, Thaliand and Andoman and Nicobar Islands) appeared to have had the brunt of the hot water, but the Maldives remains on high alert, as this El Niño event is not over yet, and indeed could strengthen. This year’s expedition is therefore ‘highly tuned’ to looking for bleaching events in the Maldives, or evidence of recent bleaching events (where the whitened corals start to be overgrown by algae). 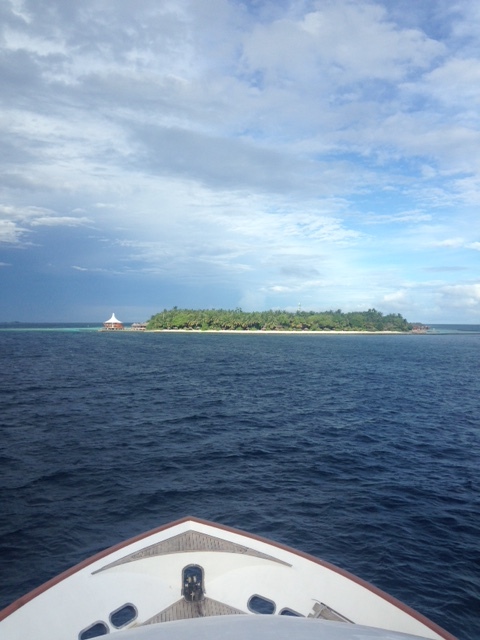 We are re-visiting sites we first surveyed in 2005 and four other sites that have been regularly monitored (once every two years) since 2011, going down the beautiful Ari Atoll from north to south. We have a survey team of eleven individuals, two trainers – one British and one Maldivian – and nine trainees (including two Maldivian placement recipients). The two placements are from the local NGO ‘The Maldives Whaleshark Research Programme’ and a local marine consultancy. 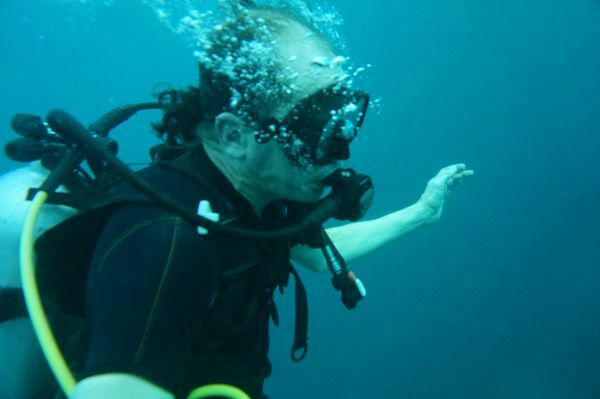 The trainers on the expedition have both been trained by Dr Jean-Luc Solandt of the Marine Conservation Society, a Reef Check Course Director and the national coordinator of Reef Check for the Maldives. My name is Catherine Edsell and I will be your expedition leader for this years Maldives expedition. Coral reef conservation is one of my passions and I led the Maldives expedition in 2014, so look forward to continuing our ongoing research with you. As you are aware, Dr. Jean-Luc Solandt is unable to join us due to personal reasons, but Mariyam Shidha Afzal, formerly from the Marine Research Centre of the Maldives, a marine biologist and experienced Reef Check Trainer will be taking his place, giving us the added benefit of her local knowledge. I’m very much looking forward to meeting you in Male on Saturday, 12 September at 11:00 at the NEW meeting point in front of the Coffee Club at Maldives Airport. I will be arriving in Male on 10 September and as soon as I get my mobile phone set up, will email you my Maldivian phone number (to be used for emergency purposes only, such as missing assembly). I hope all your preparations are going well and that you’ve had a chance to study all the Reef Check material and whale shark info available on the website as this will not only save you revision time on board, but also stand you in good stead for a fruitful expedition. We have a packed schedule planned, so please arrive rested and ready to go.